Post Road lacks the dry, stuffy quality associated with most old-school literary journals. It's not only well edited and written - but actually entertaining. What's refreshing is the eclecticism and lack of ostentatiousness in their choices - you get the sensation of a smart and super-cool coffee clutch firing off ideas to each other. 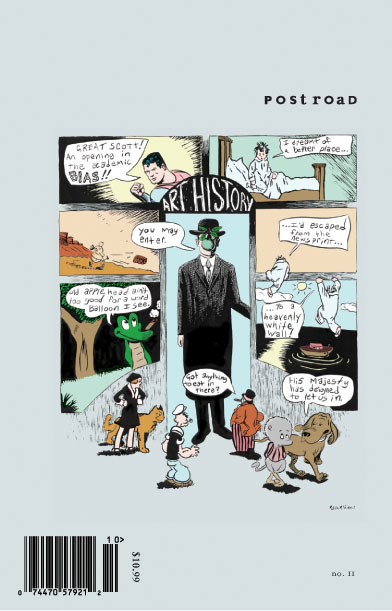 Post Road publishes criticism, fiction, non-fiction, poetry (we'll forgive them that) as well as some visual art (though not their strong point). They also have great book recommendations (written more as a pal telling you than as formal review) and a section entitled "Etcetera," which houses anything from a description of a walking tour to twenty questions for David Mamet. Issue #13 is out now. Available at St. Marks Books or online here. Post Road is currently conducting a fiction and poetry contest, with a $1000 prize for winners. Apply here. The pic above is my cover for issue #11, read the essay I wrote for it here. Yes, I'm totally biased. Deal. As usual, I discovered A Public Space initially because I wandered into their first issue party. How can you resist a beautiful loft space, free booze and a free copy of a mag?—I guess I'm pretty easy. There's a magazine launch party at least once a week in New York so aside from not really having to buy drinks, we end up with stacks of stuff to look at. Most of which is crap. In fact, it's rare that I leave a party with a magazine I'd gladly continue to buy. A Public Space is one of them and last night on my endless trip home from Dallas I read issue 3 from cover to cover. This Brooklyn-based newish (on their 3rd issue) literary magazine is edited by former Paris Review executive editor Brigid Hughes. They describe themselves this way on their about page: "We encourage writers to get away from their desks and investigate what intrigues them, explore, snoop around. There are no boundaries, and we will support writers wherever they take us." I like the theme of investigation that's present throughout the book, from David Levi-Strauss' essay on Chile and writing at night to a special section on Peru to Sam Stephenson's archiving of photographer W. Eugene Smith's life and work. All those pieces were stand outs for me. The focus on Peru is great and includes an essay on young Peruvian writers and the themes that unite them, and photographs of resistance fighters and peasant life in Peru in the 80s and 90s. It's easy for me to space out trying to read a literary journal but so far I'm really enjoying this one. Buy single issues or subscribe here. When will people learn that flash sites are not always the way to go? I would give you a link directly to this, but, since the whole site is flash, I cannot. 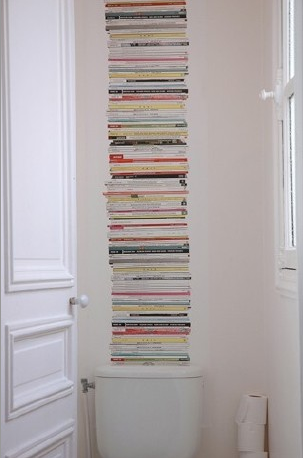 Anyway–check out this magazine stack wallpaper (click "on the wall," then "wallpaper by the meter"). Totally cute, and they have stacked softcover books, hardcover books and paper stacks wallpaper as well. Wallpaper is soooooo in right now. 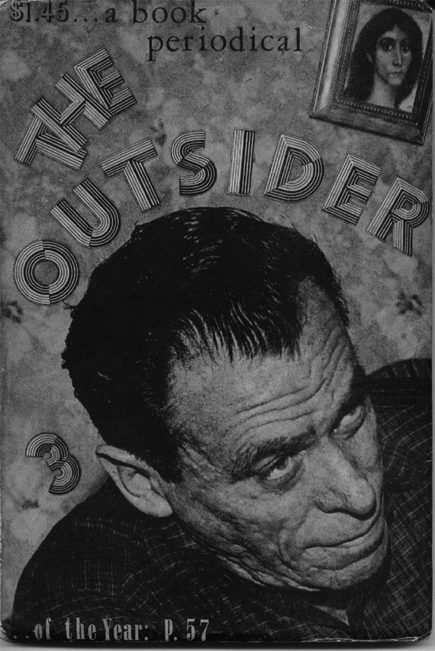 The Outsider was a legendary literary magazine that came out of the New Orleans French Quarter in the 1960's that published works by William S. Burroughs, Charles Bukowski, Allen Ginsberg, Lawrence Ferlinghetti, Denise Levertov, Robert Creeley and Walter Lowenfels. Lujon Press also published handmade books in a variety of formats by authors like Bukowski and Henry Miller. Filmmaker Wayne Ewing has a wonderful documentary about the journal and it's quirky creators, Jon and Gypsy Lou Webb. This is a must see for anyone interested in small press determination, beat writers and or the awesome history of the French Quarter. 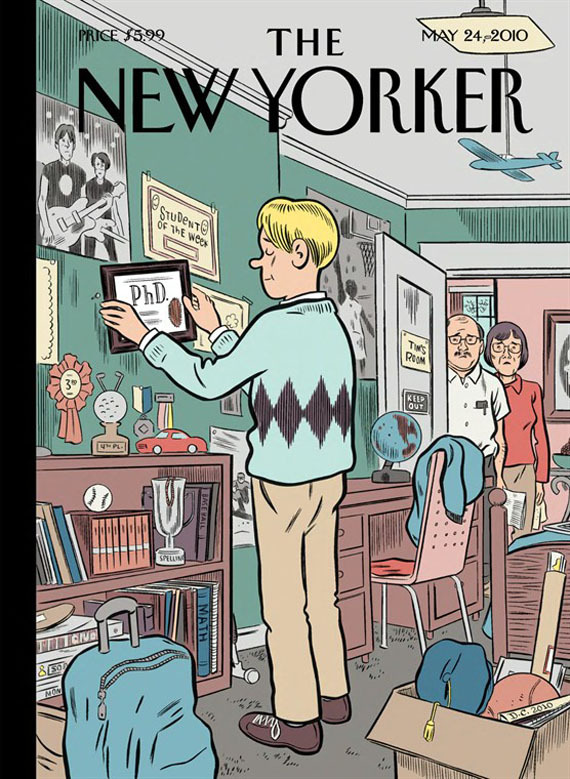 The New Yorker still rules for covers. Ideas are king. Illustrations, especially by someone as clever as Daniel Clowes, can convey ideas photographs can't even come close to. I'd like to see other magazines doing more illustrations. On another note - this cover is so uplifting!